Steven Spielberg is onboard to produce and direct a movie on Martin Luther King Jr. and I say, have at it. I'd prefer Oliver Stone gave it a shot, so we got a more accurate, warts-and-all dramatization of King's life, but whatever. The King Mythology is so far gone and commodified to sell everything from hamburgers to Starbucks coffee, I don't know that Spieblerg could make it any worst. There was some idea that Spike Lee, as the King of All Blacks (film division) should direct such a film. Umm. No. Spike's films alienate and polarize, and lets face it, I doubt he could get the budget that a Spielberg would demand. Lee's work is often uneven, whereas I am satisfied that, if nothing else, Spielberg can actually tell a story. There seems to be some infighting between the King sibs about who sold what to whom and why and for how much but it has become what we expect. The King Kids have been pimping the legacy of their father for years, and it might be time to make their own legacy, I'm thinking. The film studio says they won't make the film if all the Kings don't agree, with essentially means… this film will probably not get made, unless they all ki$$ and play nice. The Internets is all a-buzz about who will be cast as King, and I promise you, it will not be Denzel Washington, nor should it be. The Dizzle was merely a tolerable Malcolm X — Lawrence Fishburne would have killed it. No, I would wager that it will be an unknown who gets the role, so as not to distract from the power of the story itself, the way casting Washington distracted from the drama of Malcolm's story. I know what you're thinking, and no, thank you. I'm not much of an actor, and I won't be cutting my hair just for a movie role. 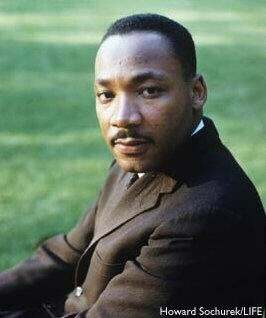 Who else do you think could bring the gravitas to play the part of Martin Luther King Jr.?